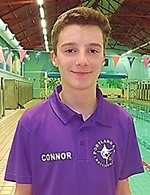 I began swimming at Portland after leaving swimming lessons at 8 years old and have been with the Club ever since. After a few years of swimming with the Club I started to swim competitively and in the years following I have tried to train and compete in both club galas and open meets as much as I can. In 2013 I was made Boys’ Captain for the 2013/14 season and the next year I was chosen to be Club Captain. I first started coaching in late 2013 for the volunteering part of the Duke of Edinburgh Bronze Award. However, after I had completed my bronze DofE, I decided to continue coaching; this led to me doing the ASA Level 1 course in 2014 and then my Level 2 training in 2015. I have really enjoyed my past two years of coaching and look forward to seeing the swimmers grow and improve in the years to come.